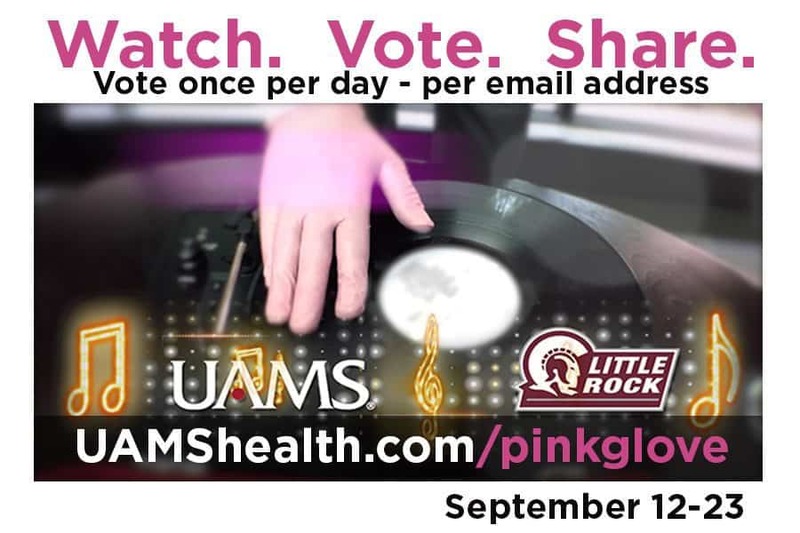 Sept. 12, 2016 | LITTLE ROCK – The public is invited to help fight breast cancer by voting online for a video featuring the dancing talents of doctors, nurses and others at the University of Arkansas for Medical Sciences (UAMS) and members of the Little Rock Trojans. The video to “Shut Up and Dance” by Walk the Moon was produced by UAMS and entered in the Medline Pink Glove Dance contest to raise breast cancer awareness. Videos are posted on the Pink Glove Dance website and are judged on the basis of votes they receive. To vote, go to www.uamshealth.com/pinkglove. Voters are eligible to vote once a day Sept. 12-23 from each email address they have. UAMS and the Little Rock Trojans teamed up to participate in the national contest sponsored by Medline, a manufacturer of medical supplies including pink gloves. The contest, which attracts entries from hospitals and organizations across the country, taps into the creativity, joy and hard work of caregivers from coast to coast. Prizes are awarded as donations to cancer charities in the name of the winner. Any prize money received by UAMS and the Little Rock Trojans will be donated to the Arkansas Affiliate of Susan G. Komen Breast Cancer Foundation. The video features more than 100 UAMS doctors, nurses and staff, along with Little Rock Trojans men’s and women’s basketball players, coaches and staff wearing pink surgical gloves. Dancers featured on the video include UAMS Chancellor Dan Rahn, M.D. ; UAMS Winthrop P. Rockefeller Cancer Institute Director Peter Emanuel, M.D. ; and media personalities from television stations KARK/KLRT, KATV and KTHV. This is UAMS’ third year to participate in the Pink Glove Dance Video contest. In 2014, UAMS won the national contest in their category and donated $10,000 to the 20th Century Club’s Lodge. Prizes include $15,000 for overall first place and $10,000 for first place in each of three categories. A few years later, Medline created the Pink Glove Dance video competition to celebrate hope for a cure and honor all who have been affected by the disease. The competition has inspired more than 1,000 dance videos and raised nearly $2.5 million for breast cancer prevention and free mammograms for women in need through the National Breast Cancer Foundation and other charitable organizations across the country. More than 200,000 people participated in Pink Glove videos nationwide in 2015.